sc = formatpoints(sc,Name,Value) modifies the scorecard points and scaling using optional name-value pair arguments. For example, use optional name-value pair arguments to change the scaling of the scores or the rounding of the points. 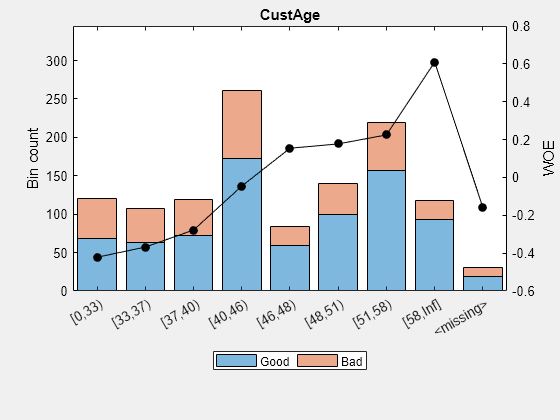 This example shows how to use formatpoints to scale by providing the Worst and Best score values. By using formatpoints to scale, you can put points and scores in a desired range that is more meaningful for practical purposes. Technically, this involves a linear transformation from the unscaled to the scaled points. Create a creditscorecard object using the CreditCardData.mat file to load the data (using a dataset from Refaat 2011). Use the 'IDVar' argument in creditscorecard to indicate that 'CustID' contains ID information and should not be included as a predictor variable. Perform automatic binning to bin for all predictors. Fit a linear regression model using default parameters. Display unscaled points for predictors retained in the fitting model and display the minimum and maximum possible unscaled scores. Scale by providing the 'Worst' and 'Best' score values. The range provided below is a common score range. Display the points information again to verify that they are now scaled and also display the scaled minimum and maximum scores. As expected, the values of MinScore and MaxScore correspond to the desired worst and best scores. This example shows how to use formatpoints to scale by providing the Shift and Slope values. By using formatpoints to scale, you can put points and scores in a desired range that is more meaningful for practical purposes. Technically, this involves a linear transformation from the unscaled to the scaled points by the formatpoints function. Scale by providing the 'Shift' and 'Slope' values. In this example, there is an arbitrary choice of shift and slope. Display the points information again to verify that they are now scaled and also display the scaled minimum and maximum scores. This example shows how to use formatpoints to scale by providing the points, odds levels, and PDO (points to double the odds). By using formatpoints to scale, you can put points and scores in a desired range that is more meaningful for practical purposes. Technically, this involves a linear transformation from the unscaled to the scaled points by the formatpoints function. Scale by providing the points, odds levels, and PDO (points to double the odds). Suppose that you want a score of 500 points to have odds of 2 (twice as likely to be good than to be bad) and that the odds double every 50 points (so that 550 points would have odds of 4). This example shows how to use formatpoints to separate the base points from the rest of the points assigned to each predictor variable. The formatpoints name-value pair argument 'BasePoints' serves this purpose. By setting the name-value pair argument BasePoints to true, the points information table reports the base points separately in the first row. The minimum and maximum possible scores are not affected by this option. This example shows how to use formatpoints to round points. Rounding is usually applied after scaling, otherwise, if the points for a particular predictor are all in a small range, rounding could cause the rounded points for different bins to be the same. Also, rounding all the points may slightly change the minimum and maximum total points. Scale points, and display the points information. By default, no rounding is applied. Use the name-value pair argument Round to apply rounding for all points and then display the points information again. 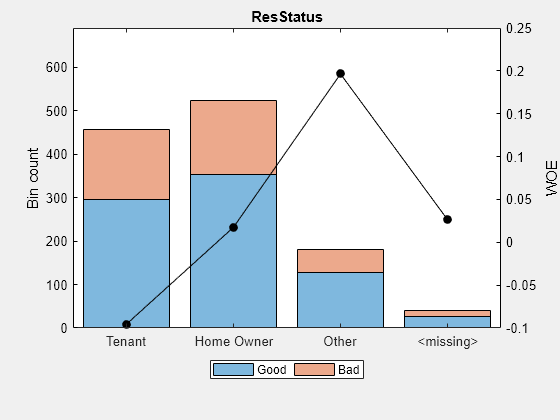 This example shows how to use formatpoints to score missing or out-of-range data. When data is scored, some observations can be either missing (NaN, or undefined) or out of range. You will need to decide whether or not points are assigned to these cases. Use the name-value pair argument Missing to do so. Indicate that the minimum allowed value for 'CustAge' is zero. This makes any negative values for age invalid or out-of-range. Suppose there are missing or out of range observations in the data that you want to score. Notice that by default, the points and score assigned to the missing value is NaN. Use the name-value pair argument Missing to replace NaN with points corresponding to a zero Weight-of-Evidence (WOE). Alternatively, use the name-value pair argument Missing to replace the missing value with the minimum points for the predictors that have the missing values. As a third alternative, use the name-value pair argument Missing to replace the missing value with the maximum points for the predictors that have the missing values. Verify that the minimum and maximum points assigned to the missing data correspond to the minimum and maximum points for the corresponding predictors. The points for 'CustAge' are reported in the first seven rows of the points information table. For 'ResStatus' the points are in rows 8 through 10. This example describes the assignment of points for missing data when the 'BinMissingData' option is set to true. Predictors that have missing data in the training set have an explicit bin for <missing> with corresponding points in the final scorecard. These points are computed from the Weight-of-Evidence (WOE) value for the <missing> bin and the logistic model coefficients. For scoring purposes, these points are assigned to missing values and to out-of-range values. Predictors with no missing data in the training set have no <missing> bin, therefore no WOE can be estimated from the training data. By default, the points for missing and out-of-range values are set to NaN, and this leads to a score of NaN when running score. For predictors that have no explicit <missing> bin, use the name-value argument 'Missing' in formatpoints to indicate how missing data should be treated for scoring purposes. Create a creditscorecard object using the CreditCardData.mat file to load the dataMissing with missing values. Use creditscorecard with the name-value argument 'BinMissingData' set to true to bin the missing numeric or categorical data in a separate bin. Apply automatic binning. Set a minimum value of zero for CustAge and CustIncome. With this, any negative age or income information becomes invalid or "out-of-range". For scoring purposes, out-of-range values are given the same points as missing values. For the 'CustAge' and 'ResStatus' predictors, there is missing data (NaNs and <undefined>) in the training data, and the binning process estimates a WOE value of -0.15787 and 0.026469 respectively for missing data in these predictors, as shown above. For EmpStatus and CustIncome there is no explicit bin for missing values because the training data has no missing values for these predictors. Use fitmodel to fit a logistic regression model using Weight of Evidence (WOE) data. fitmodel internally transforms all the predictor variables into WOE values, using the bins found with the automatic binning process. fitmodel then fits a logistic regression model using a stepwise method (by default). For predictors that have missing data, there is an explicit <missing> bin, with a corresponding WOE value computed from the data. When using fitmodel, the corresponding WOE value for the <missing> bin is applied when performing the WOE transformation. Scale the scorecard points by the "points, odds, and points to double the odds (PDO)" method using the 'PointsOddsAndPDO' argument of formatpoints. Suppose that you want a score of 500 points to have odds of 2 (twice as likely to be good than to be bad) and that the odds double every 50 points (so that 550 points would have odds of 4). Display the scorecard showing the scaled points for predictors retained in the fitting model. Notice that points for the <missing> bin for CustAge and ResStatus are explicitly shown (as 64.9836 and 74.1250, respectively). These points are computed from the WOE value for the <missing> bin, and the logistic model coefficients. For predictors that have no missing data in the training set, there is no explicit <missing> bin. By default the points are set to NaN for missing data and they lead to a score of NaN when running score. For predictors that have no explicit <missing> bin, use the name-value argument 'Missing' in formatpoints to indicate how missing data should be treated for scoring purposes. For the purpose of illustration, take a few rows from the original data as test data and introduce some missing data. Also introduce some invalid, or out-of-range values. For numeric data, values below the minimum (or above the maximum) allowed are considered invalid, such as a negative value for age (recall 'MinValue' was earlier set to 0 for CustAge and CustIncome). For categorical data, invalid values are categories not explicitly included in the scorecard, for example, a residential status not previously mapped to scorecard categories, such as "House", or a meaningless string such as "abc123". Score the new data and see how points are assigned for missing CustAge and ResStatus, because we have an explicit bin with points for <missing>. However, for EmpStatus and CustIncome the score function sets the points to NaN. Use the name-value argument 'Missing' in formatpoints to choose how to assign points to missing values for predictors that do not have an explicit <missing> bin. In this example, use the 'MinPoints' option for the 'Missing' argument. The minimum points for EmpStatus in the scorecard displayed above are 58.8072, and for CustIncome the minimum points are 29.3753. ShiftAndSlope, PointsOddsAndPDO, and WorstAndBestScores are scaling methods and you can use only one of these name-value pair arguments at one time. The other three name-value pair arguments (BasePoints, Missing, and Round) are not scaling methods and can be used together or with any one of the three scaling methods. Indicator for separating base points, specified as the comma-separated pair consisting of 'BasePoints' and a logical scalar. If true, the scorecard explicitly separates base points. If false, the base points are spread across all variables in the creditscorecard object. NoScore — Missing and out-of-range data do not get points assigned and points are set to NaN. Also, the total score is set to NaN. ZeroWOE — Missing or out-of-range data get assigned a zero Weight-of-Evidence (WOE) value. MinPoints — Missing or out-of-range data get the minimum possible points for that predictor. This penalizes the score if higher scores are better. MaxPoints — Missing or out-of-range data get the maximum possible points for that predictor. This penalizes the score if lower scores are better. When using the creditscorecard name-value argument 'BinMissingData' with a value of true, missing data for numeric and categorical predictors is binned in a separate bin labeled <missing>. The <missing> bin only contains missing values for a predictor and does not contain invalid or out-of-range values for a predictor. None — No rounding is applied. AllPoints — Apply rounding to each predictor's points before adding up the total score. FinalScore — Round the final score only (rounding is applied after all points are added up). Indicator for shift and slope scaling parameters for the credit scorecard, specified as the comma-separated pair consisting of 'ShiftAndSlope' and a numeric array with two elements [Shift, Slope]. Slope cannot be zero. The ShiftAndSlope values are used scale the scoring model. To remove a previous scaling and revert to unscaled scores, set ShiftAndSlope to[0,1]. Indicator for target points (Points) for a given odds level (Odds) and the desired number of points to double the odds (PDO), specified as the comma-separated pair consisting of 'PointsOddsAndPDO' and a numeric array with three elements [Points,Odds,PDO]. Odds must be a positive number. The PointsOddsAndPDO values are used to find scaling parameters for the scoring model. 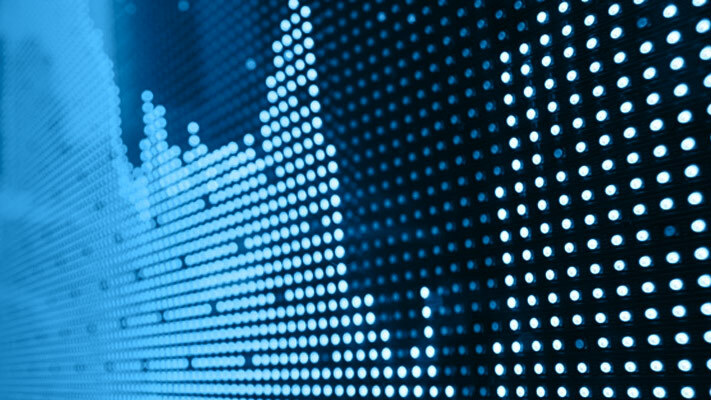 The points to double the odds (PDO) may be positive or negative, depending on whether higher scores mean lower risk, or vice versa. Indicator for worst (highest risk) and best (lowest risk) scores in the scorecard, specified as the comma-separated pair consisting of 'WorstAndBestScores' and a numeric array with two elements [WorstScore,BestScore]. WorstScore and BestScore must be different values. These WorstAndBestScores values are used to find scaling parameters for the scoring model. WorstScore means the riskiest score, and its value could be lower or higher than the ‘best’ score. In other words, the ‘minimum’ score may be the ‘worst‘ score or the 'best' score, depending on the desired scoring scale. Credit scorecard model returned as an updated creditscorecard object. For more information on using the creditscorecard object, see creditscorecard. where bj is the coefficient of the jth variable in the model, and WOEj(i) is the Weight of Evidence (WOE) value for the ith individual corresponding to the jth model variable. Shift and Slope are scaling constants further discussed below. The scaling constant can be controlled with formatpoints. s = b0 + b1*WOE1(i) + ... +bp*WOEp(i). For simplicity, assume in the description above that the j-th variable in the model is the j-th column in the data input, although, in general, the order of variables in a given dataset does not have to match the order of variables in the model, and the dataset could have additional variables that are not used in the model. where p is the number of predictors in the scorecard model. score if rounding is 'FinalScore': round(Score(i)). smax = b0 + max(b1*WOE1) + ... +max(bp*WOEp). where Points, Odds, and PDO ("points to double the odds") are the first, second, and third elements in the PointsOddsAndPDO parameter. Whenever a given dataset has a missing or out-of-range value data (i,j), the points for predictor j, for individual i, are set to NaN by default, which results in a missing score for that row (a NaN score). Using the Missing parameter for formatpoints, you can modify this behavior and set the corresponding Weight-of-Evidence (WOE) value to zero, or set the points to the minimum points, or the maximum points for that predictor.